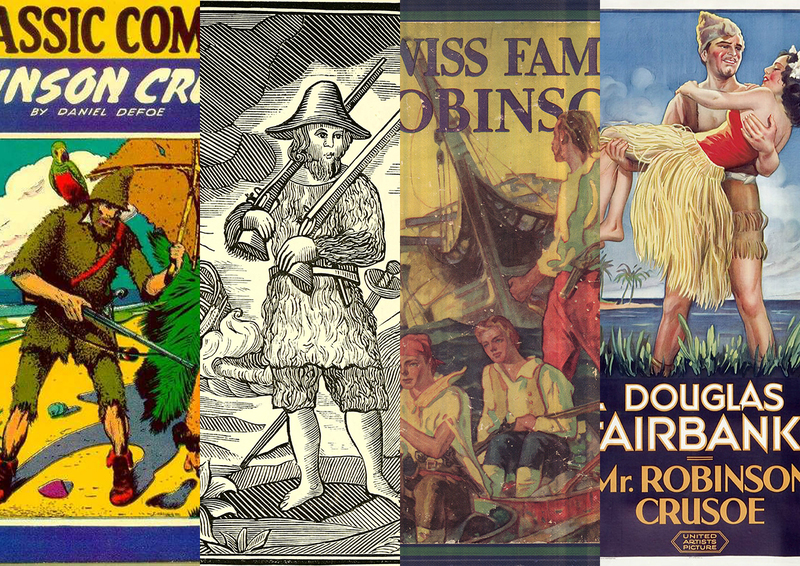 Reading 1,400-plus editions of “Robinson Crusoe” in one summer is impossible. So one team of students tried to train computers to do it for them. Since Daniel Defoe’s shipwreck tale “Robinson Crusoe” was first published nearly 300 years ago, thousands of editions and spinoff versions have been published, in hundreds of languages. A research team led by Grant Glass, a Ph.D. student in English and comparative literature at the University of North Carolina at Chapel Hill, wanted to know how the story changed as it went through various editions, imitations and translations, and to see which parts stood the test of time. Reading through them all at a pace of one a day would take years. Instead, the researchers are training computers to do it for them. This summer, Glass’ team in the Data+ summer research program used computer algorithms and machine learning techniques to sift through 1,482 full-text versions of Robinson Crusoe, compiled from online archives. “When you pick up a book it’s important to know what copy it is, because that can affect the way you think about the story,” Glass said. Just getting the texts into a form that a computer could process proved half the battle, said undergraduate team member Orgil Batzaya, a Duke double major in math and computer science. The books were already scanned and posted online, so the students used software to download the scans from the internet, via a process called “scraping.” But processing the scanned pages of old printed books, some of which had smudges, specks or worn type, and converting them to a machine-readable format proved trickier than they thought. The software struggled to decode the strange spellings (“deliver’d,” “wish’d,” “perswasions,” “shore” versus “shoar”), different typefaces between editions, and other quirks. Special characters unique to 18th century fonts, such as the curious f-shaped version of the letter “s,” make even humans read “diftance” and “poffible” with a mental lisp. Their first attempts came up with gobbledygook. “The resulting optical character recognition was completely unusable,” said team member and Duke senior Gabriel Guedes. At a Data+ poster session in August, Guedes, Batzaya and history and computer science double major Lucian Li presented their initial results: a collection of colorful scatter plots, maps, flowcharts and line graphs. Once they turned the scanned pages into machine-readable texts, the team fed them into a machine learning algorithm that measures the similarity between documents. The algorithm takes in chunks of texts — sentences, paragraphs, even entire novels — and converts them to high-dimensional vectors. Creating this numeric representation of each book, Guedes said, made it possible to perform mathematical operations on them. They added up the vectors for each book to find their sum, calculated the mean, and looked to see which edition was closest to the “average” edition. It turned out to be a version of Robinson Crusoe published in Glasgow in 1875. They also analyzed the importance of specific plot points in determining a given edition’s closeness to the “average” edition: what about the moment when Crusoe spots a footprint in the sand and realizes that he’s not alone? Or the time when Crusoe and Friday, after leaving the island, battle hungry wolves in the Pyrenees? The team’s results might be jarring to those unaccustomed to seeing 300 years of publishing reduced to a bar chart. But by using computers to compare thousands of books at a time, “digital humanities” scholars say it’s possible to trace large-scale patterns and trends that humans poring over individual books can’t. “This is really something only a computer can do,” Guedes said, pointing to a time-lapse map showing how the Crusoe story spread across the globe, built from data on the place and date of publication for 15,000 editions. Data+ is sponsored by Bass Connections, the Information Initiative at Duke, the Social Science Research Institute, the departments of Mathematics and Statistical Science and MEDx. This project team was also supported by the Duke Office of Information Technology. Other Duke sponsors include DTECH, Duke Health, Sanford School of Public Policy, Nicholas School of the Environment, Development and Alumni Affairs, Energy Initiative, Franklin Humanities Institute, Duke Forge, Duke Clinical Research, Office for Information Technology and the Office of the Provost, as well as the departments of Electrical & Computer Engineering, Computer Science, Biomedical Engineering, Biostatistics & Bioinformatics and Biology. Government funding comes from the National Science Foundation. Outside funding comes from Lenovo, Power for All and SAS. Community partnerships, data and interesting problems come from the Durham Police and Sheriff’s Department, Glenn Elementary PTA, and the City of Durham. 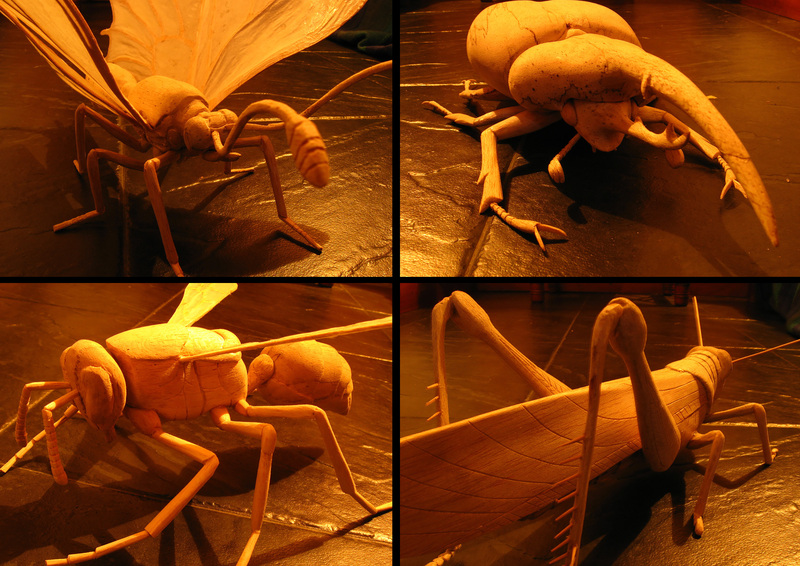 Duke biologist Alejandro Berrio creates larger-than-life insect sculptures. 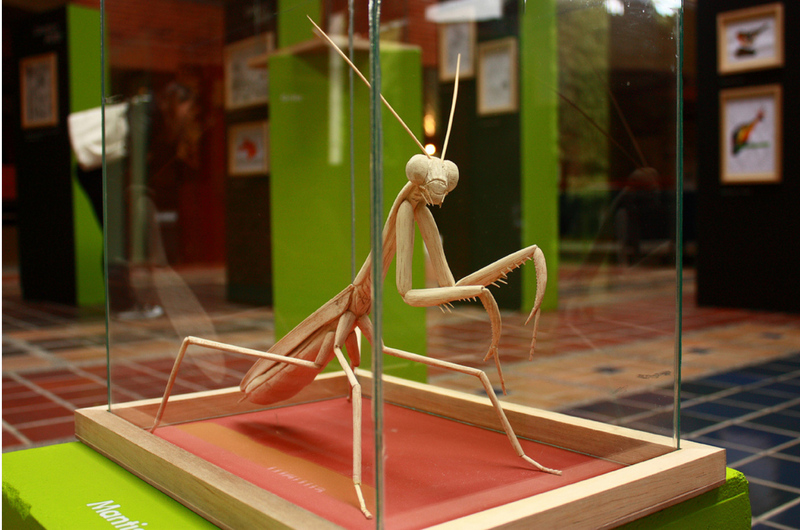 This wooden mantis was exhibited at the Art Science Gallery in Austin, Texas in 2013. On a recent spring morning, biologist Alejandro Berrio took a break from running genetic analyses on a supercomputer to talk about an unusual passion: creating larger-than-life insect sculptures. Berrio is a postdoctoral associate in professor Greg Wray’s lab at Duke. He’s also a woodcarver, having exhibited his shoebox-sized models of praying mantises, wasps, crickets and other creatures in museums and galleries in his hometown and in Austin, Texas, where his earned his Ph.D. The Colombia-born scientist started carving wood in his early teens, when he got interested in model airplanes. He built them out of pieces of lightweight balsa wood that he bought in craft shops. Beetle carved by Duke biologist Alejandro Berrio. His first carvings were of mosquitoes — the main insect in his lab — hand carved from soft balsa wood with an X-Acto knife. Using photographs for reference, he would sketch the insects from different positions before he started carving. He worked at his kitchen table, shaping the body from balsa wood or basswood. “I might start with a power saw to make the general form, and then with sandpaper until I started getting the shape I wanted,” Berrio said. He used metal to join and position the segments in the legs and antennae, then set the joints in place with glue. Soon Berrio was carving wooden fungi, dragons, turtles, a snail. “Whatever people wanted me to make,” Berrio said. He earned just enough money to pay for his lunch, or the bus ride to school. 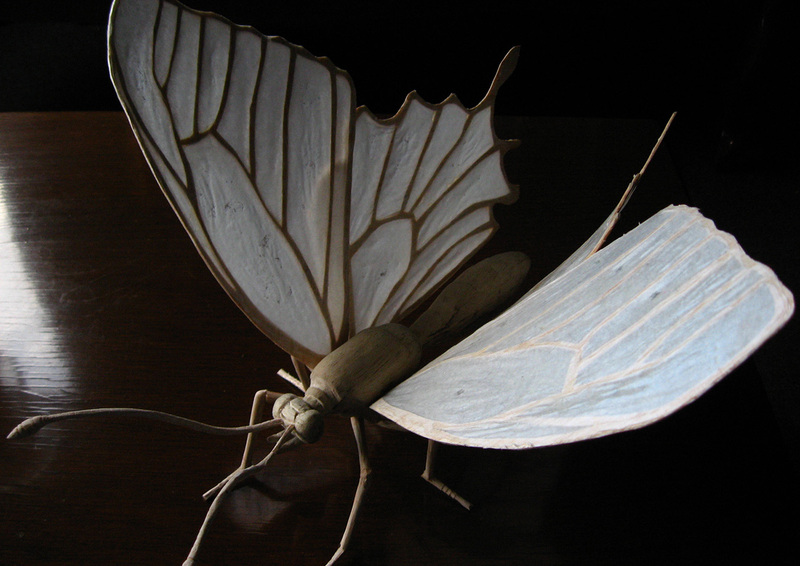 Duke biologist Alejandro Berrio carved this butterfly using balsa wood for the body and legs, and paper for the wings. His pieces can take anywhere from a week to two months to complete. “This butterfly was the most time-consuming,” he said, pointing to a model with translucent veined wings. 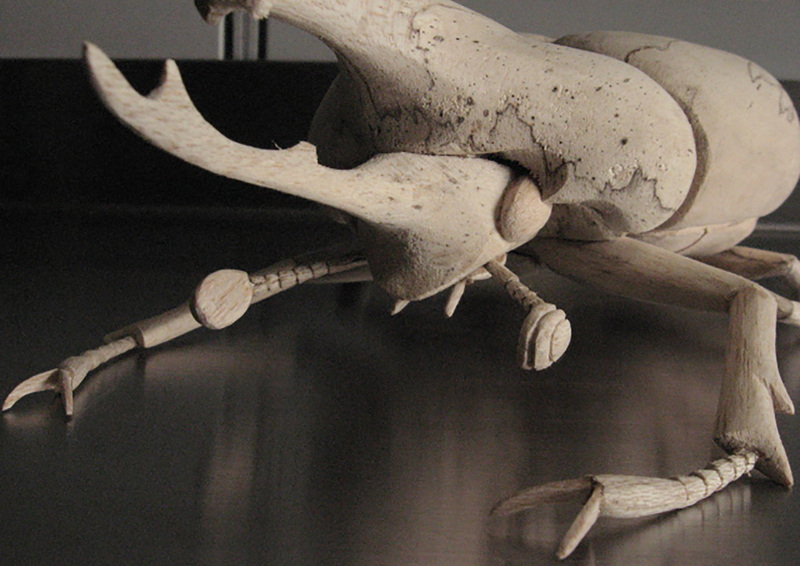 Insect sculptures by Duke biologist Alejandro Berrio. Explore more of Berrio’s sculpture and photography at https://www.flickr.com/photos/alejoberrio/. Duke’s tech game is stronger than you might think. 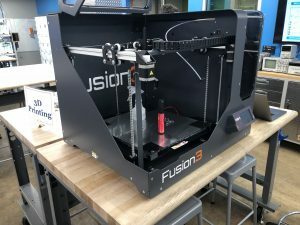 OIT held an “I Love Tech Fair” in the Technology Engagement Center / Co-Lab on Feb. 6 that was open to anyone to come check out things like 3D printers and augmented reality, while munching on some Chick-fil-a and cookies. There was a raffle for some sweet prizes, too. I got a full demonstration of the 3D printing process—it’s so easy! It requires some really expensive software called Fusion, but thankfully Duke is awesome and students can get it for free. You can make some killer stuff 3D printing, the technology is so advanced now. I’ve seen all kinds of things: models of my friend’s head, a doorstop made out of someone’s name … one guy even made a working ukulele apparently! One of the cooler things at the fair was Augmented Reality books. These books look like ordinary picture books, but looking at a page through your phone’s camera, the image suddenly comes to life in 3D with tons of detail and color, seemingly floating above the book! All you have to do is download an app and get the right book. 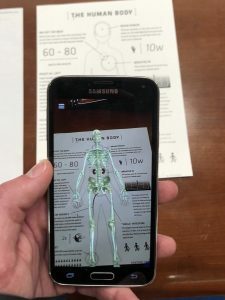 Augmented reality is only getting better as time goes on and will soon be a primary tool in education and gaming, which is why Duke Digital Initiative (DDI) wanted to show it off. By far my favorite exhibit at the tech fair was virtual reality. Throw on a headset and some bulky goggles, grab a controller in each hand, and suddenly you’re in another world. The guy running the station, Mark McGill, had actually hand-built the machine that ran it all. Very impressive guy. 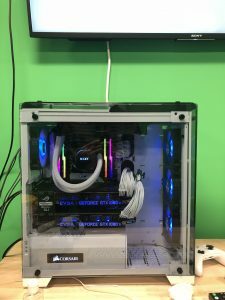 He told me the machine is the most expensive and important part, since it accounts for how smooth the immersion is. The smoother the immersion, the more realistic the experience. And boy, was it smooth. 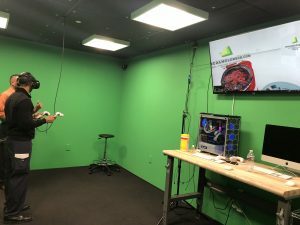 A couple years ago I experienced virtual reality at my high school and thought it was cool (I did get a little nauseous), but after Mark set me up with the “HTC Vive” connected to his sophisticated machine, it blew me away (with no nausea, too). I smiled the whole time playing “Super Hot,” where I killed incoming waves of people in slow motion with ninja stars, guns, and rocks. Mark had tons of other games too, all downloaded from Steam, for both entertainment and educational purposes. One called “Organon” lets you examine human anatomy inside and out, and you can even upload your own MRIs. There’s an unbelievable amount of possibilities VR offers. You could conquer your fear of public speaking by being simulated in front of a crowd, or realistically tour “the VR Museum of Fine Art.” Games like these just aren’t the same were you to play them on, say, an Xbox, because it simply doesn’t have that key factor of feeling like you’re there. In Fallout 4, your heart pounds fast in your chest as you blast away Feral Ghouls and Super Mutants right in front of you. But in reality, you’re just standing in a green room with stupid looking goggles on. Awesome! There’s another place on campus — the Bolt VR in Edens residence hall — that also has a cutting-edge VR setup going. Mark explained to me that Duke wants people to get experience with VR, as it will soon be a huge part of our lives. Having exposure now could give Duke graduates a very valuable head start in their career (while also making Duke look good). Plus, it’s nice to have on campus for offering students a fun break from all the hard work we put in. If you’re bummed you missed out, or even if you don’t “love tech,” I recommend checking out the Tech Fair next time — February 13, from 6-8pm. See you there. X-ray vision just got cooler. A technique developed in recent years boosts researchers’ ability to see through the body and capture high-resolution images of animals inside and out. This special type of 3-D scanning reveals not only bones, teeth and other hard tissues, but also muscles, blood vessels and other soft structures that are difficult to see using conventional X-ray techniques. Researchers have been using the method, called diceCT, to visualize the internal anatomy of dozens of different species at Duke’s Shared Materials Instrumentation Facility (SMIF). There, the specimens are stained with an iodine solution that helps soft tissues absorb X-rays, then placed in a micro-CT scanner, which takes thousands of X-ray images from different angles while the specimen spins around. A computer then stitches the scans into digital cross sections and stacks them, like slices of bread, to create a virtual 3-D model that can be rotated, dissected and measured as if by hand. Duke cardiologist Christopher Kontos, M.D., and MD/PhD student Hasan Abbas have been using the technique to visualize the inside of a mouse’s leg. The researchers hope the images will shed light on changes in blood vessels in people, particularly those with peripheral artery disease, in which plaque buildup in the arteries reduces blood flow to the extremities such as the legs and feet. The micro-CT scanner at Duke’s Shared Materials Instrumentation Facility made it possible for Abbas and Kontos to see structures as small as 13 microns, or a fraction of the width of a human hair, including muscle fibers and even small arteries and veins in 3-D.
DiceCT imaging allows Heather Kristjanson at the Johns Hopkins School of Medicine to digitally dissect the chewing muscles of animals such as this tree shrew, a small mammal from Southeast Asia that looks like a cross between a mouse and a squirrel. By virtually zooming in and measuring muscle volume and the length of muscle fibers, she hopes to see how strong they were. Studying such clues in modern mammals helps Kristjanson and colleagues reconstruct similar features in the earliest primates that lived millions of years ago. Students and instructors who are interested in trying the technique in their research are eligible to apply for vouchers to cover SMIF fees. People at Duke University and elsewhere are encouraged to apply. For more information visit https://smif.pratt.duke.edu/Funding_Opportunities, or contact Dr. Mark Walters, Director of SMIF, via email at mark.walters@duke.edu. Located on Duke’s West Campus in the Fitzpatrick Building, the SMIF is a shared use facility available to Duke researchers and educators as well as external users from other universities, government laboratories or industry through a partnership called the Research Triangle Nanotechnology Network. For more info visit http://smif.pratt.duke.edu/. Panic in the Poster Session! 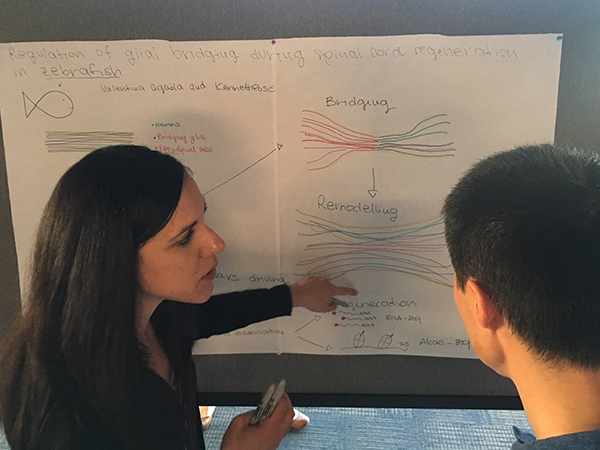 For their recent retreat, Regeneration Next tried something a little different for the time-honored poster session. 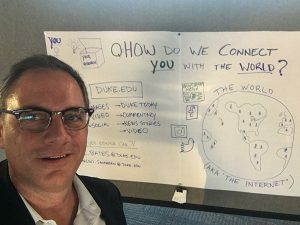 Rather than simply un-tubing that poster they took to the American Association of Whatever a few months ago, presenters were asked to DRAW their poster fresh and hot on a plain sheet of white paper in 15 minutes, using nothing more than an idea and a couple of markers. Concerns were shared, shall we say, with the leadership of the regenerative medicine initiative when the rules were announced. There was palpable poster panic as the retreat moved to the wide open fifth floor of the Trent Semans Center in the late afternoon. Administrative coordinator Tiffany Casey had spread out a rainbow of brand-new sharpies and the moveable bulletin boards stood in neat, numbered ranks with plain white sheets of giant post-it paper. 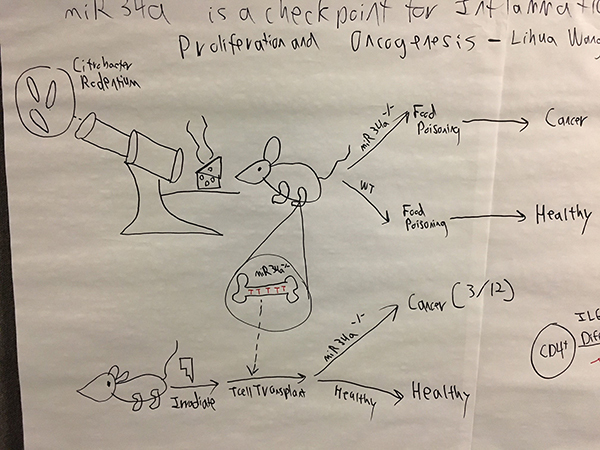 After some nervous laughter and a few attempts at color-swapping, the trainees and junior faculty got down to drawing their science on the wobbly tackboards. And then, it worked! It totally worked. “I think I saw a lot more interactivity and conversation,” Sankaran said. A fist-full of colorful sharpies gave Valentina Cigliola a colorful launching point for some good conversations about spinal cord repair, rather than just standing there mutely while visitors read and read and read. 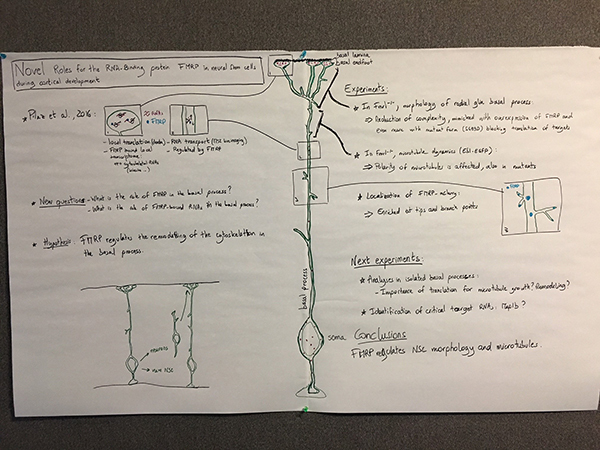 Louis-Jan Pilaz used the entire height of the giant post-it notes to draw a beautifully detailed neuron, with labeled parts explaining how the RNA-binding protein FMRP does some neat tricks during development of the cortex. Delisa Clay’s schematics of fruitfly cells having too many chromosomes made it easier to explain. Well, that and maybe a glass of wine. 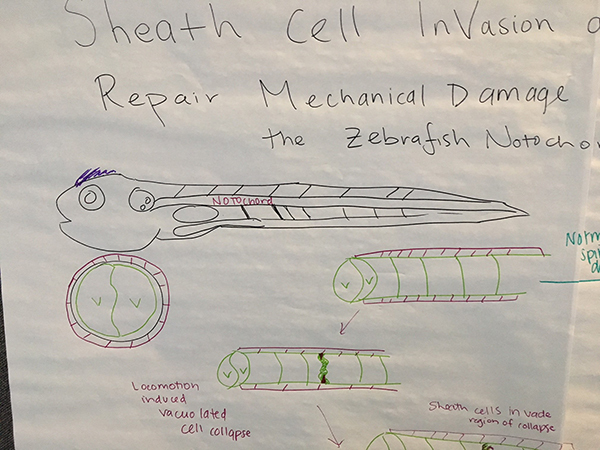 Jamie Garcia used her cell-by-cell familiarity with the zebrafish to make a bold, clear illustration of notochord development and the fish’s amazing powers of self-repair. Don’t you think Lihua Wang’s schematic of experimental results is so much more clear than a bunch of panels of tiny text and bar charts? 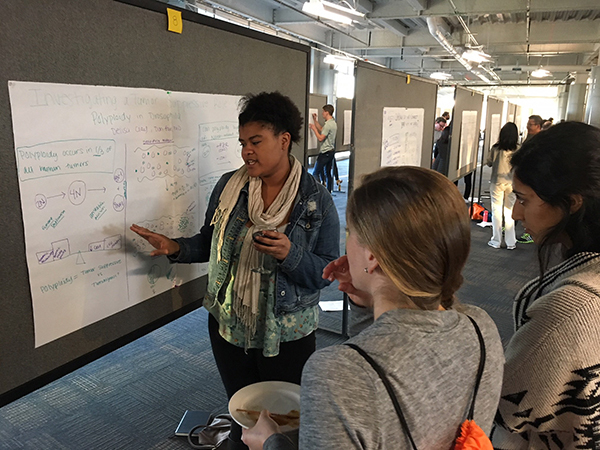 In the post-retreat survey, Sankaran said people either absolutely loved the draw-your-poster or hated it, but the Love group was much larger. A few folks also pointed out that the drawing approach might work against people with a disability of some sort – a concern Sankaran said they will try to address next time. Post and pix by Karl Leif Bates, whose hand-drawn poster on working with the news office contained no data and was largely ignored. Ghost bikes are a haunting site. The white-painted bicycles, often decorated with flowers or photographs, mark the locations where cyclists have been hit and killed on the street. A Ghost Bike located in Chapel Hill, NC. Four of these memorials currently line the streets of Durham, and the statistics on non-fatal crashes in the community are equally sobering. According to data gathered by the North Carolina Department of Transportation, Durham county averaged 23 bicycle and 116 pedestrian crashes per year between 2011 and 2015. But a team of Duke researchers say these grim crash data may also reveal clues for how to make Durham’s streets safer for bikers, walkers, and drivers. 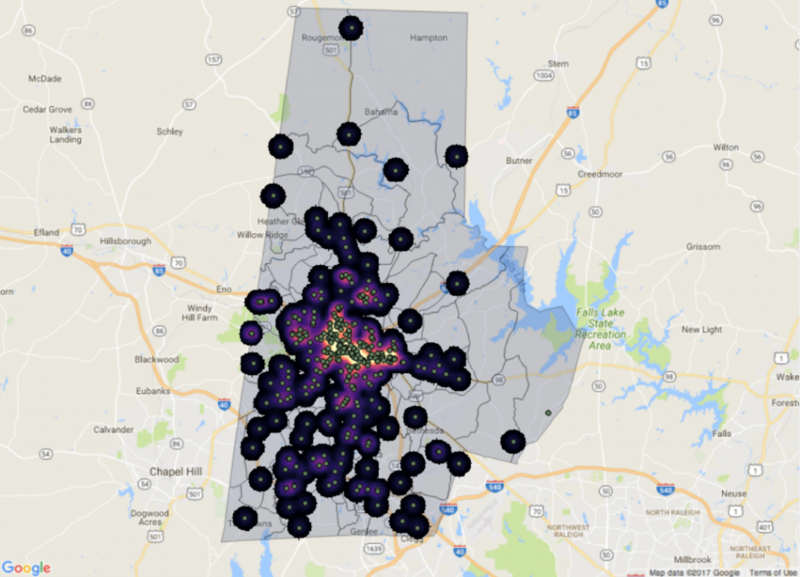 This summer, a team of Duke students partnered with Durham’s Department of Transportation to analyze and map pedestrian, bicycle and motor vehicle crash data as part of the 10-week Data+ summer research program. In the Ghost Bikes project, the team created an interactive website that allows users to explore how different factors such as the time-of-day, weather conditions, and sociodemographics affect crash risk. Insights from the data also allowed the team to develop policy recommendations for improving the safety of Durham’s streets. “Ideally this could help make things safer, help people stay out of hospitals and save lives,” said Lauren Fox, a Duke cultural anthropology major who graduated this spring, and a member of the DATA+ Ghost Bikes team. A heat map from the team’s interactive website shows areas with the highest density of bicycle crashes, overlaid with the locations of individual bicycle crashes. The final analysis showed some surprising trends. “For pedestrians the most common crash isn’t actually happening at intersections, it is happening at what is called mid-block crossings, which happen when someone is crossing in the middle of the road,” Fox said. To mitigate the risks, the team’s Executive Summary includes recommendations to install crosswalks, median islands and bike lanes to roads with a high density of crashes. They also found that males, who make up about two-thirds of bicycle commuters over the age of 16, are involved in 75% of bicycle crashes. To build their website, the team integrated more than 20 sets of crash data from a wide variety of different sources, including city, county, regional and state reports, and in an array of formats, from maps to Excel spreadsheets. 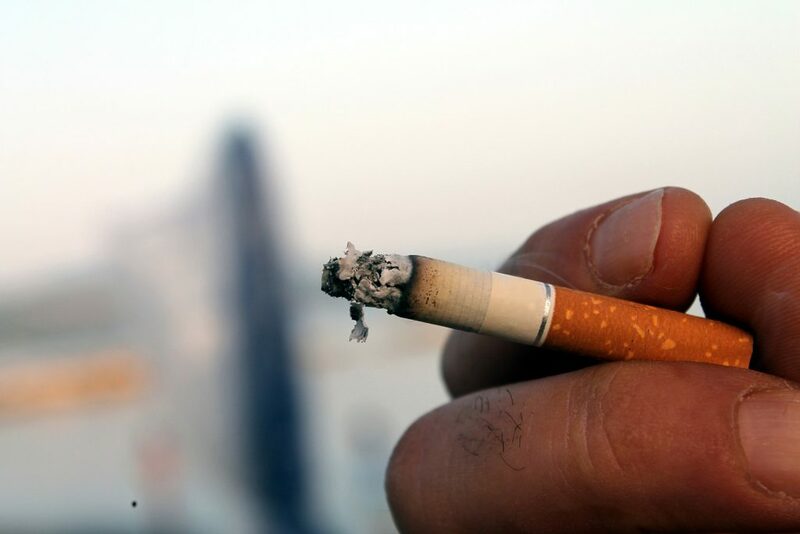 “They had to fit together many different data sources that don’t necessarily speak to each other,” said faculty advisor Harris Solomon, an associate professor of cultural anthropology and global health at Duke. The Ghost Bikes project arose out of Solomon’s research on traffic accidents in India, supported by the National Science Foundation Cultural Anthropology Program. In Solomon’s Spring 2017 anthropology and global health seminar, students explored the role of the ghost bikes as memorials in the Durham community. 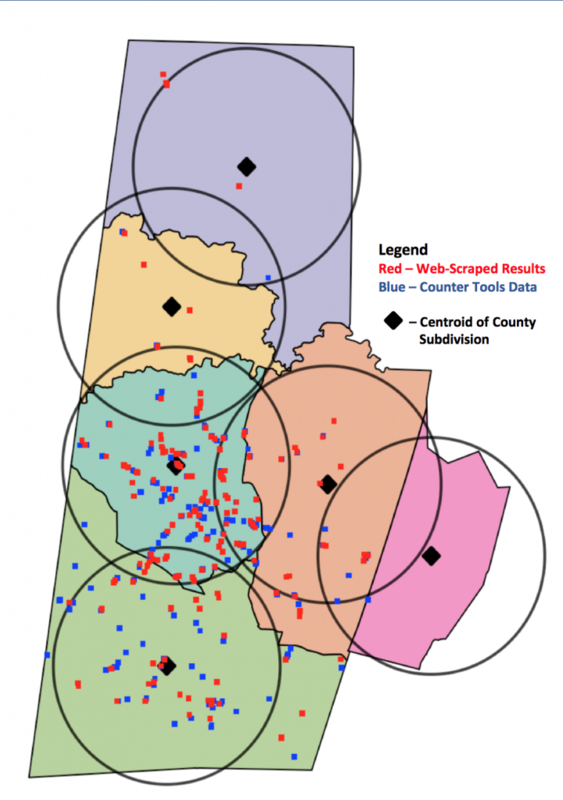 The Data+ team approached the same issues from a more quantitative angle, Solomon said. “I was surprised to see how many stakeholders there are in biking,” Fox said. For example, she added, the simple act of adding a bike lane requires balancing the needs of bicyclists, nearby residents concerned with home values or parking spots, and buses or ambulances who require access to the road. “I hadn’t seen policy work that closely in my classes, so it was interesting to see that there aren’t really simple solutions,” Fox said. Data+ is sponsored by Bass Connections, the Information Initiative at Duke, the Social Science Research Institute, the departments of Mathematics and Statistical Science and MEDx. 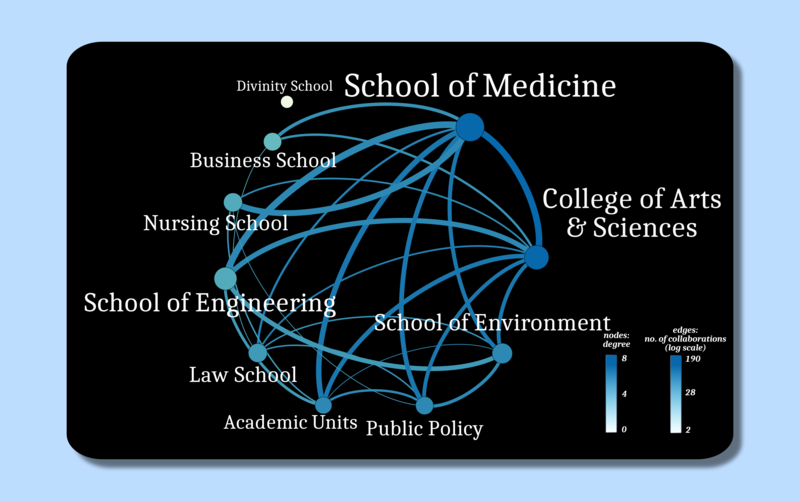 Other Duke sponsors include DTECH, Duke Health, Sanford School of Public Policy, Nicholas School of the Environment, Development and Alumni Affairs, Energy Initiative, Franklin Humanities Institute, Duke Institute for Brain Sciences, Office for Information Technology and the Office of the Provost, as well as the departments of Electrical & Computer Engineering, Computer Science, Biomedical Engineering, Biostatistics & Bioinformatics and Biology. Government funding comes from the National Science Foundation. Outside funding comes from Accenture, Academic Analytics, Counter Tools and an anonymous donation. Community partnerships, data and interesting problems come from the Durham Police Department, Durham Neighborhood Compass, Cary Institute of Ecosystem Studies, Duke Marine Lab, Center for Child and Family Policy, Northeast Ohio Medical University, TD Bank, Epsilon, Duke School of Nursing, University of Southern California, Durham Bicycle and Pedestrian Advisory Commission, Duke Surgery, MyHealth Teams, North Carolina Museum of Art and Scholars@Duke. DURHAM, N.C. — A mere seven-plus decades after she first appeared in comic books in the early 1940s, Wonder Woman finally has her own movie. In the two months since it premiered, the film has brought in more than $785 million worldwide, making it the highest grossing movie of the summer. But if Hollywood has seen a number of recent hits with strong female leads, from “Wonder Woman” and “Atomic Blonde” to “Hidden Figures,” it doesn’t signal a change in how women are depicted on screen — at least not yet. Those are the conclusions of three students who spent ten weeks this summer compiling and analyzing data on women’s roles in American film, through the Data+ summer research program. The team relied on a measure called the Bechdel test, first depicted by the cartoonist Alison Bechdel in 1985. The “Bechdel test” asks whether a movie features at least two women who talk to each other about anything besides a man. Surprisingly, a lot of films fail. Art by Srravya [CC0], via Wikimedia Commons. To pass the Bechdel test, a movie must satisfy three basic requirements: it must have at least two named women in it, they must talk to each other, and their conversation must be about something other than a man. It’s a low bar. The female characters don’t have to have power, or purpose, or buck gender stereotypes. Even a movie in which two women only speak to each other briefly in one scene, about nail polish — as was the case with “American Hustle” — gets a passing grade. And yet more than 40 percent of all U.S. films fail. The team used data from the bechdeltest.com website, a user-compiled database of over 7,000 movies where volunteers rate films based on the Bechdel criteria. The number of criteria a film passes adds up to its Bechdel score. “Spider Man,” “The Jungle Book,” “Star Trek Beyond” and “The Hobbit” all fail by at least one of the criteria. Films are more likely to pass today than they were in the 1970s, according to a 2014 study by FiveThirtyEight, the data journalism site created by Nate Silver. The authors of that study analyzed 1,794 movies released between 1970 and 2013. They found that the number of passing films rose steadily from 1970 to 1995 but then began to stall. In the past two decades, the proportion of passing films hasn’t budged. 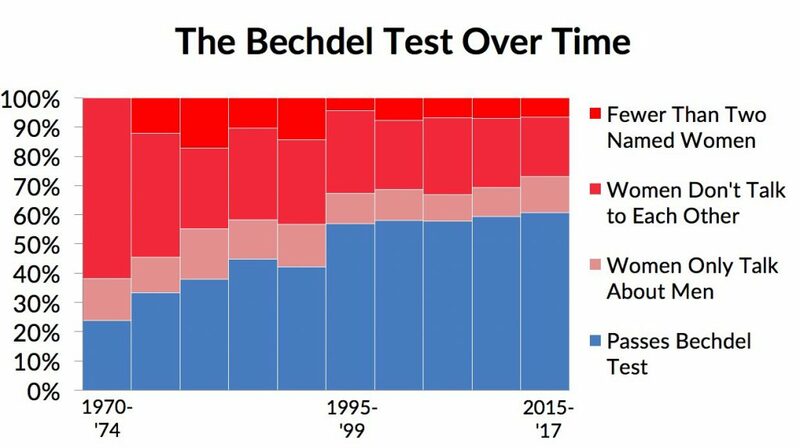 Since the mid-1990s, the proportion of films that pass the Bechdel test has flatlined at about 50 percent. The Duke team was also able to obtain data from a 2016 study of the gender breakdown of movie dialogue in roughly 2,000 screenplays. Men played two out of three top speaking roles in more than 80 percent of films, according to that study. Using data from the screenplay study, the students plotted the relationship between a movie’s Bechdel score and the number of words spoken by female characters. Perhaps not surprisingly, films with higher Bechdel scores were also more likely to achieve gender parity in terms of speaking roles. “The Bechdel test doesn’t really tell you if a film is feminist,” but it’s a good indicator of how much women speak, said team member Sammy Garland, a Duke sophomore majoring in statistics and Chinese. Previous studies suggest that men do twice as much talking in most films — a proportion that has remained largely unchanged since 1995. The reason, researchers say, is not because male characters are more talkative individually, but because there are simply more male roles. “To close the gap of speaking time, we just need more female characters,” said team member Selen Berkman, a sophomore majoring in math and computer science. Achieving that, they say, ultimately comes down to who writes the script and chooses the cast. 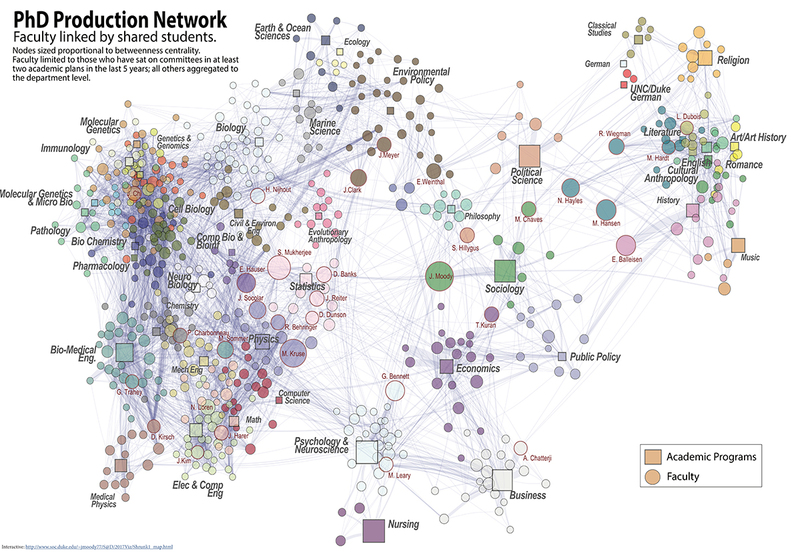 The team did a network analysis of patterns of collaboration among 10,000 directors, writers and producers. Two people are joined whenever they worked together on the same movie. 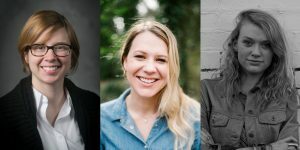 The 13 most influential and well-connected people in the American film industry were all men, whose films had average Bechdel scores ranging from 1.5 to 2.6 — meaning no top producer is regularly making films that pass the Bechdel test. “What this tells us is there is no one big influential producer who is moving the needle. We have no champion,” Garland said. Men and women were equally represented in fewer than 10 percent of production crews. But assembling a more gender-balanced production team in the early stages of a film can make a difference, research shows. Films with more women in top production roles have female characters who speak more too. “To better represent women on screen you need more women behind the scenes,” Garland said. Dollar for dollar, making an effort to close the Hollywood gender gap can mean better returns at the box office too. Films that pass the Bechdel test earn $2.68 for every dollar spent, compared with $2.45 for films that fail — a 23-cent better return on investment, according to FiveThirtyEight. Other versions of the Bechdel test have been proposed to measure race and gender in film more broadly. The advantage of analyzing the Bechdel data is that thousands of films have already been scored, said English major and Data+ team member Aaron VanSteinberg. “We tried to watch a movie a week, but we just didn’t have time to watch thousands of movies,” VanSteinberg said. A new report on diversity in Hollywood from the University of Southern California suggests the same lack of progress is true for other groups as well. In nearly 900 top-grossing films from 2007 to 2016, disabled, Latino and LGBTQ characters were consistently underrepresented relative to their makeup in the U.S. population. Berkman, Garland and VanSteinberg were among more than 70 students selected for the 2017 Data+ program, which included data-driven projects on photojournalism, art restoration, public policy and more. They presented their work at the Data+ Final Symposium on July 28 in Gross Hall. DURHAM, N.C. — Most Americans can charge their cell phones, raid the fridge or boot up their laptops at any time without a second thought. Not so for the 1.2 billion people — roughly 16 percent of the world’s population — with no access to electricity. Despite improvements over the past two decades, an estimated 780 million people will still be without power by 2030, especially in rural parts of sub-Saharan Africa, Asia and the Pacific. To get power to these people, first officials need to locate them. But for much of the developing world, reliable, up-to-date data on electricity access is hard to come by. Researchers say remote sensing can help. 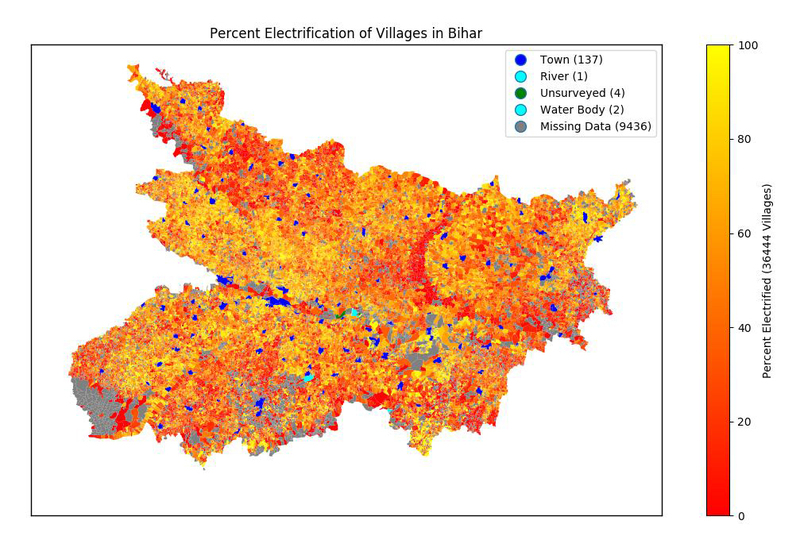 Led by researchers in the Energy Data Analytics Lab and the Sustainable Energy Transitions Initiative, “the initial goal was to create a map of India, showing every village or town that does or does not have access to electricity,” said team member Trishul Nagenalli. Electricity makes it possible to pump groundwater for crops, refrigerate food and medicines, and study or work after dark. But in parts of rural India, where Nagenalli’s parents grew up, many households use kerosene lamps to light homes at night, and wood or animal dung as cooking fuel. Fires from overturned kerosene lamps are not uncommon, and indoor air pollution from cooking with solid fuels contributes to low birth weight, pneumonia and other health problems. 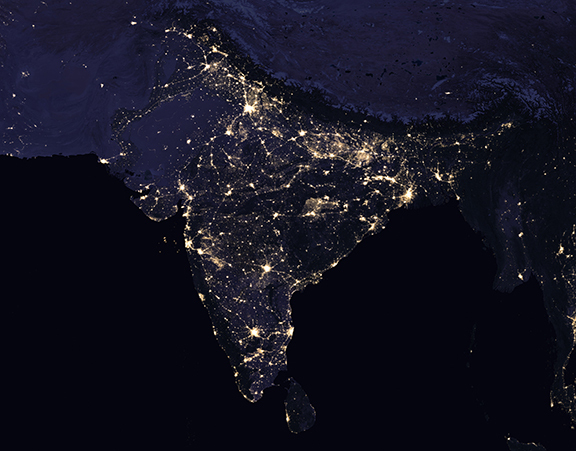 In 2005, the Indian government set out to provide electricity to all households within five years. Yet a quarter of India’s population still lives without power. Ultimately, the goal is to create a machine learning algorithm — basically a set of instructions for a computer to follow — that can recognize power plants, irrigated fields and other indicators of electricity in satellite images, much like the algorithms that recognize your face on Facebook. Rather than being programmed with specific instructions, machine learning algorithms “learn” from large amounts of data. This summer the researchers focused on the unsung first step in the process: preparing the training data. Fellow Duke students Gouttham Chandrasekar, Shamikh Hossain and Boning Li were also part of the effort. 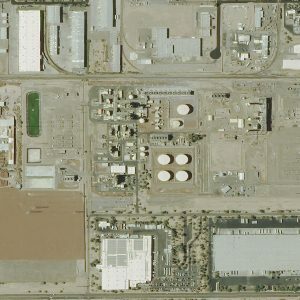 First they compiled publicly available satellite images of U.S. power plants. Rather than painstakingly framing and labeling the plants in each photo themselves, they tapped the powers of the Internet to outsource the task and hired other people to annotate the images for them, using a crowdsourcing service called Amazon Mechanical Turk. So far, they have collected more than 8,500 image annotations of different kinds of power plants, including oil, natural gas, hydroelectric and solar. The team also compiled firsthand observations of the electrification rate for more than 36,000 villages in the Indian state of Bihar, which has one of the lowest electrification rates in the country. For each village, they also gathered satellite images showing light intensity at night, along with density of green land and other indicators of irrigated farms, as proxies for electricity consumption. Using these data sets, the goal is to develop a computer algorithm which, through machine learning, teaches itself to detect similar features in unlabeled images, and distinguishes towns and villages that are connected to the grid from those that aren’t. “We would like to develop our final algorithm to essentially go into a developing country and analyze whether or not a community there has access to electricity, and if so what kind,” Chandrasekar said. The project is far from finished. During the 2017-2018 school year, a Bass Connections team will continue to build on their work. The summer team presented their research at the Data+ Final Symposium on July 28 in Gross Hall. Data+ is sponsored by Bass Connections, the Information Initiative at Duke, the Social Science Research Institute, the departments of mathematics and statistical science and MEDx. This project team was also supported by the Duke University Energy Initiative.